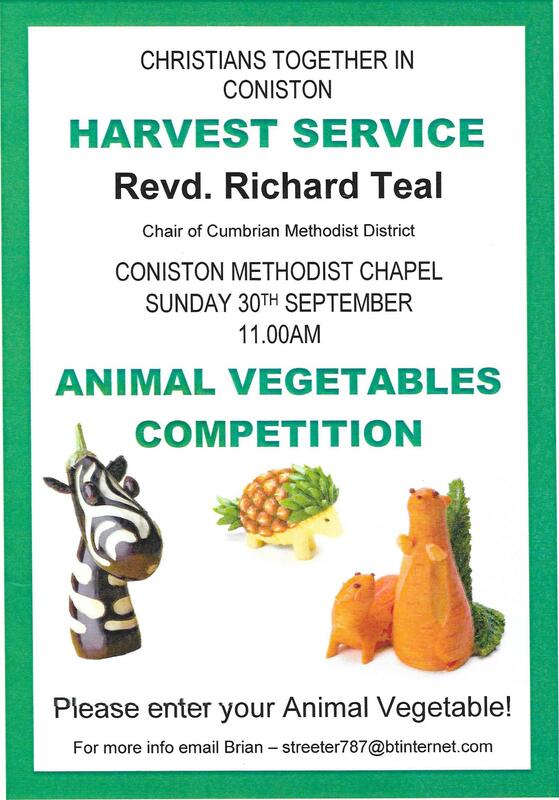 Harvest Sunday, 30 September at the Methodist Chapel. All welcome! This entry was posted in Discipleship, Mission, Services, Special Events, Youth on September 13, 2018 by angelweb. Back from your holidays or just visiting? Here’s what’s on late April! A few choice morsels of activity to take us to the end of April. There is something for everyone here! 11 a.m., Worship for All, St. Andrew’s Church, Coniston. With plenty of sheep around Coniston, it won’t be hard to talk about the meaning of the Good Shepherd. 6 p.m., Cafe Church, Coniston Institute. Come along and hear from our Furness Network Youth Team about what’s happening in the area. Enjoy a hot supper too! 10 a.m., Concern, Coniston Methodist Church. A time to pray about area concerns. 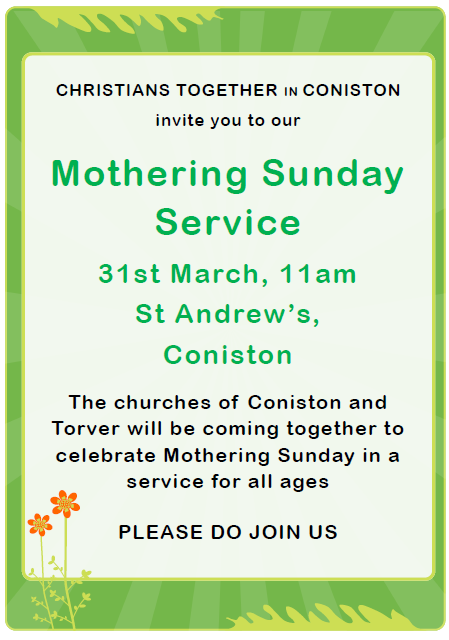 2 p.m., Mother’s Union, St. Andrew’s Church Coniston. Physician and christian Alex Stewart will share his faith in action from experiences in Pakistan. 11 a.m., Worship for All, Coniston Primary School. It’s the 5th Sunday and that means we worship together (Christians Together) in Coniston. Join the Christian Fellowship, the Church of England and the Methodist Churches as we enjoy an inclusive time of sharing. These events will take us through to glorious May. 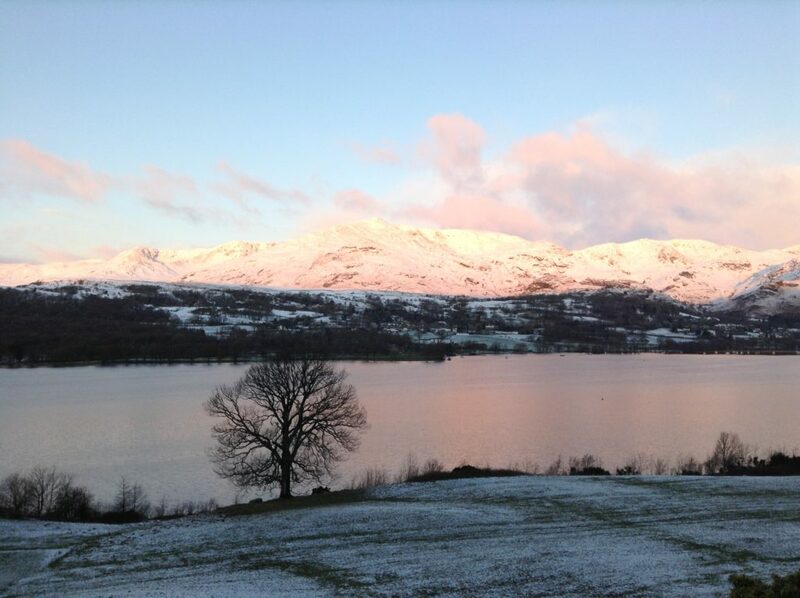 In Coniston we are blessed to have some of the most beautiful landscape in the world. This means we get to meet lots of wonderful people from around the world. All welcome! This entry was posted in Mother's Union, Prayer, Services, St. Lukes Torver, Youth on April 21, 2018 by angelweb. Final Lent Study, Christians Together in Coniston. Each session is different. All welcome. Maundy Thursday meditation and meal. Christians Together in Coniston, All welcome. 11 a.m., A Walk of Witness will begin at the entrance to the churchyard by Donald Campbell’s grave. Christiand Together in Coniston. All welcome. 7:30 a.m., Outside Blue Bird cafe on the shores of Coniston Water. A short Easter Sunrise service of praise. Bacon Butties to follow at the Blue Bird cafe. 9:00 a.m., Biker’s Breakfast, Old School Room Torver. This will be the first Biker’s Breakfast of the season and Easter Sunday. Great praise and great food! 11 a.m., Family Friendly Easter Celebration and Holy Communion at St. Andrew’s Church Coniston. This is a combined service with the Fellowship. Charlie Day, our Youth Worker is leading and Brian Streeter is leading communion and preaching. This entry was posted in Discipleship, Mission, Prayer, Services, Special Events, St. Lukes Torver, Youth on March 27, 2018 by angelweb. UNITY WEEK: 21 – 28 January. comes from the Caribbean, and a number of events are planned for the week. Hawkshead Hill Chapel. More details to come. 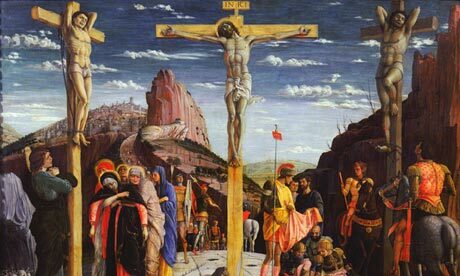 This entry was posted in Discipleship, Services, Special Events, Spirituality on January 2, 2018 by angelweb. On Sunday the 7th of January, The Venerable Vernon Ross will be officiating at the Licensing Service of The Revd Brian Streeter as Priest in Charge of the Benefice of Coniston and Torver. This will be the only service of the day on Sunday the 7th at Brian’s other local churches. We look forward to meeting together at the 2:30 p.m. service at St. Andrew’s Church in Coniston. Everyone is welcome to attend the service to meet Brian and Anne and for the refreshments afterwards. This entry was posted in Mission, Services, Special Events on January 2, 2018 by angelweb.